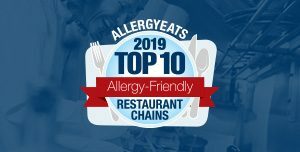 AllergyEats’ Top Reviewer: Over 100 Restaurants and Counting! 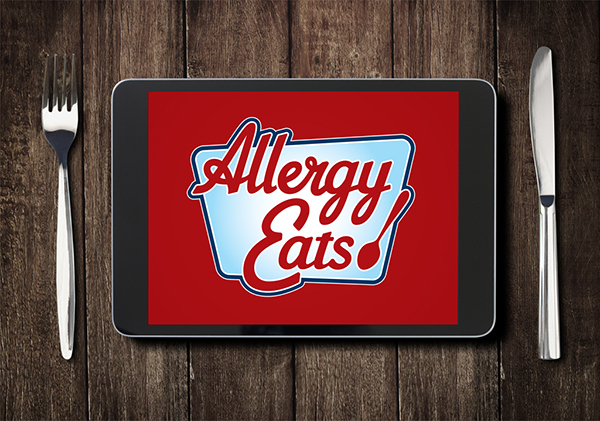 We have a great community here at AllergyEats – so many people who believe in our mantra “We’re all in this together.” Each time one of our members adds even just a single new rating, it helps all the food-allergic diners who visit our app and website. Of course, there are also our “power raters,” for lack of a better phrase – those members who rates dozens and dozens of restaurants. 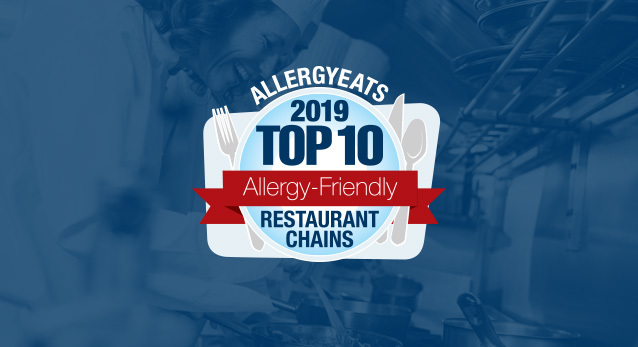 One such member has rated so many restaurants, with such detailed and valuable reviews, that she has earned more recognition points than all other members… even those of us working here at AllergyEats! We needed to learn more about her. 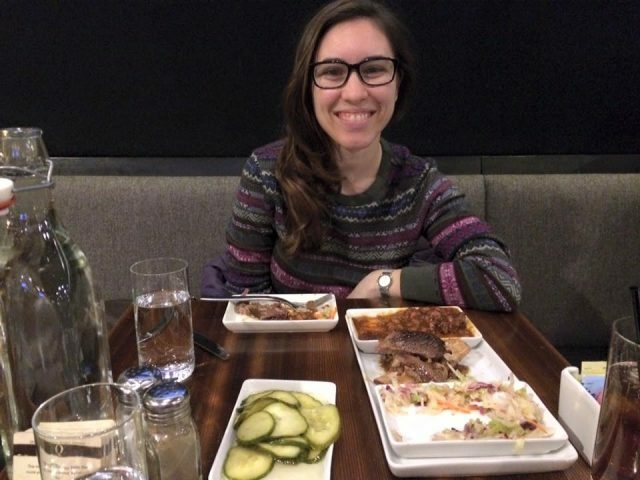 What follows is her great story about embracing your allergies with a positive attitude, partnering with other family members, and the importance of how a little planning and a lot of communication goes a long way when it comes to dining out with food allergies. AllergyEats: Tell us a little about your food allergy journey, what allergies you have, when you were diagnosed and how it felt growing up with these allergies. Deborah Blumenthal: I have anaphylactic allergies to dairy and peanuts, and borderline allergies to tree nuts, except coconuts. I was diagnosed at 18 months old, so I have no memory of it other than what my parents have told me, which is that they tried giving me things like yogurt and cottage cheese, causing me to throw up constantly. So they had me tested, and that’s how they found out. 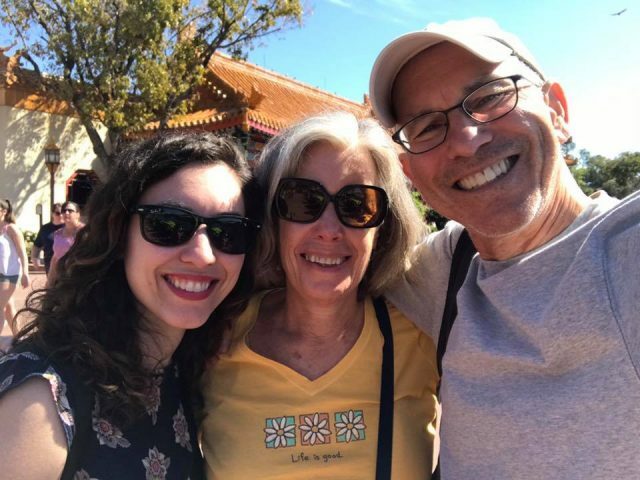 Deborah and Her Amazing Food Allergy Advocates – Her Parents! That was my childhood, and frankly, we didn’t eat out much, I think because it was just a hassle and scary. When we did, we kept it very easy. I ate a lot of plain pasta with ketchup and a lot of salads. We just kind of did it the easy way and ate at home a lot. My parents have a few family friends who my parents taught to cook for me, and that was kind of it – we kept it really close to home. AE: Did it scare you when you went out to eat and you’d see how incredibly serious your parents were taking your food allergies and how they had to educate restaurant staff (who were much less knowledgeable and familiar with food allergies as they are now)? DB: I don’t remember it being scary, to be honest. We had a few places in my hometown where my parents got to know the owners, and because I was just ordering something so easy, I think it became kind of a ritual. But I do remember – I was maybe not even 13 – going to Charleston, and when traveling, I think eating out becomes a necessity rather than something that you want to do when you have really serious allergies. We just sort of blindly picked a restaurant, and I remember my dad asking the manager to just make plain pasta in water with no butter, and he said to my parents, “Do you expect me to stop my kitchen for this?” I was old enough to be angry and frustrated. But I do think if we had ever asked people to do anything more elaborate than that, maybe I would have found it scary. DB: I went to college in Manhattan and I grew up really close to New York City, so I found a couple of places that were okay for me. I was raised Jewish and Kosher food is extremely convenient for people who have dairy allergies. I ate a lot of that because there is an abundance of it in New York, and before I started, we met with the guy who ran the dining hall. I went to Barnard, which is part of Columbia, which has a really big Jewish population so there was a kosher food plan, which again, made it really easy. But the first year, we were required to be in a dorm that didn’t have a kitchen, and we had come up with some sort of arrangement where I could have a microwave that wasn’t shared, because college students get cheese everywhere in a microwave. We had to go through the Office of Disability Services and it was a lot of procedures, but I made it work. Then the first year that I was able, I had an apartment with a kitchen and really just prepared my own food, because it was just easier. AE: So you went to college close to home, but now, based on your ratings on AllergyEats, it seems like you travel a ton. We’re always amazed here at how many restaurants you rate all over the country. DB: Yes, I travel a lot now. I moved to Chicago when I was 24, so almost seven years ago, and my family is still on the East Coast, so I travel a lot to see them. AE: How challenging is that with your food allergies, and do your allergies ever hold you back from a trip? DB: I’ll answer the first part of that first. It’s gotten a lot easier. I remember Disney World, which we can talk about later, was a really big part of this sort of awakening that I think I’ve had in the past five, ten years. But when I traveled as a kid, we definitely kept it really easy. I let my parents handle everything because I didn’t want to talk to managers myself. Even more recently, if I traveled, I would rent an apartment or do an Airbnb and make sure that I had a kitchen, either as a fallback or the way that I would provide food entirely for myself. There was a period in my life where I was really phobic of restaurants. I think it happened probably when I moved, because at least in New York I had a short list of places that I knew I could go, I knew I could be safe, and it was comfortable and easy. Then, when I moved here, it was brand new. Chicago has so many restaurants and it just seemed easier and safer to not bother. I got really good at—you know, if my friends wanted to go to dinner, getting a salad or just having a drink and going for the company and really just—it was part fear, and part just not wanting to deal with, frankly, the hassle of it and how much work you have to go through to explain to somebody how to not kill you. It had never occurred to me to do this. I have no idea why. She just made these phone calls as I was sitting next to her. I also think that on the West Coast, especially in L.A., they have heard everything and they will do anything. 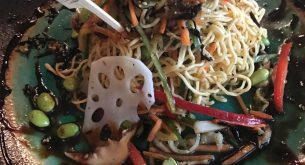 That was the first trip where I really ate out a lot and really enjoyed it, and started to see, sort of, what kind of rock I had been living under and how much the food industry is starting to change, and how much people are educated and willing. That was really, really exciting! After that, I started to dip my toes in, in other cities, and I did the same thing she did. I would call places ahead and ask them. Typically, the answer for me is yes [that I can be accommodated]. I’ve been doing that same kind of thing ever since. AE: Just backing up, Deborah, I like the phrase you used, “…the awakening that started with Disney World.” Tell us about that. DB: This is actually kind of a unique story, but my dad used to work for PricewaterhouseCoopers, and in the mid to late ’90s, they used to have these big sectional gatherings at places that you could bring your wife and kids to, so they did a few of them at Disney World. One of them was at the Grand Floridian, where we happened to meet the guy who was the head chef there at the time, and he’d come to Disney from of the big soy companies. He had a background in food science and he was really interested in figuring out ways to accommodate me. It was like having a personal chef for a week, and I had chocolate pudding for the first time and he made me pizza. He would just sort of follow me around the resort being like, look what I made, look what I created for you. He was one of the people who was instrumental in creating what we now know as the gold standard of food allergy programs at Disney. I remember going back a few years later after he had left and having the chef come sit down next to me, and seeing that develop. But it used to be that Disney was really the only place I felt comfortable, and now I’m starting to see that level of care in other places, which is really exciting. 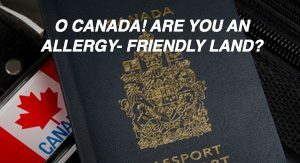 AE: In all of your travels, do any cities stand out as being particularly allergy-friendly? DB: L.A., for sure. I think it may just be a West Coast thing. They have a lot of people who are gluten free or vegan by choice, so none of it seemed shocking to them. I was just in Minneapolis last week where they’re really big on organics, farm-to-table, and I find those places to be easy and accommodating. I did pretty well in D.C. a few years ago. I think the one thing that I have not really tackled yet is international. I’ve been overseas a few times, but usually just cook for myself. I do find that a little bit scary. AE: Among all these trips and your 100+ restaurant reviews on AllergyEats, which restaurant or restaurants stand out as your favorites and why? DB: There’s a recent one. My parents actually just moved to Florida and they happened upon a restaurant called Farmer’s Table, and my dad did what my dad does and talked to the chef and the whole thing. Farmer’s Table actually doesn’t cook with butter, so that makes things really easy off the bat. I met their executive chef the first time I was there, and unfortunately, he recently left, but his sous chef took over —both are deeply confident, totally understanding, and even bring you the food themselves. Even in talking to other people on the staff there, they’re all very highly trained. It’s one of those things where an easy menu to start with certainly makes the whole thing easier. But, they do use cheese and almond milk occasionally, so you do still have to be vigilant. The food’s great, it’s creative and they made me a flatbread with Daiya cheese. Where else….last weekend, I was at the French Meadow Bakery and Café in Minneapolis. I had remembered their name because I used to buy their frozen packaged brownies Whole Foods. They were really willing to make modifications. I wouldn’t normally have asked this anywhere else, but they had a chicken piccata on their menu, and I thought, maybe there’s a slight chance they make it without dairy because they were very good about being vegan-flexible and all that. They usually make it with butter, but offered to do it with vegan butter for me, which was shocking and very nice. There’s another restaurant, Il Cielo in L.A., that I think is wonderful. They do everything from scratch. They were just kind and accommodating. I also have been to a lot of places in Chicago that have just been really creative and willing to go the extra mile. Everything owned by Lettuce Entertain You is great – I love it. I love the places, and I’ve talked to some of their managers at length about what goes on behind the scenes. They own a ramen restaurant downtown called Ramen-san and they do their broth traditionally with butter, but they did one with tahini paste for me instead, which was really creative and I never would have thought of that. But yes, it’s nice to see people go out of their way and not just be like, sorry, you can’t have this. AE: Have you found that the more upscale restaurants are as accommodating as some at the casual-dining level? DB: That’s what I’ve found. I find that chefs in hotel restaurants are typically really highly trained. One of the things that I think, as I started to branch out with my parents’ help, is that it seems like the upscale places are more likely to help you out. Before I go somewhere, it takes a ton of research. I’ll start with AllergyEats, and a lot of times if it’s an obscure town or something, there may not be many ratings. So if I find something that looks interesting, I’ll just Google the name of the restaurant, plus allergies. I’ll look for places that either are vegan and don’t have a lot of nuts, or have vegan options, or are vegan-flexible. I’ll also look for places that do organic, farm-to-table and make everything from scratch kind of places. The thing is, it can be such an abyss of options and you don’t know where to start so those are things that I tend to look for when I do research. I’ll even look up “best restaurants in whatever city” and just sort of look at their menus and see. I think you can get a sense of what can and can’t work for you pretty easily. Sometimes there’s nothing, which is then when I get on the phone and start asking. People are typically really honest. A few weeks ago, I spoke to someone and they said, “….with cross-contamination, the risk is really high.” I can tell within 10 seconds of that conversation, whether someone is taking you seriously, but also whether they understand — whether they’re comfortable and all of those things that play into it You can tell when people sort of go silent and they’re nervous. It is a bit of a guessing game, but I think you get better at it, figuring out what’s going on on the other side of the conversation. AE: It sounds like you do quite a bit on the phone before you even get to the restaurant. Is that accurate? DB: Yes, I do. I’m just a planner when I travel, in general, and it makes the whole thing easier. It’s a little bit less stressful if you at least have a list of places you think are okay. AE: Your reviews on AllergyEats are so detailed, so high quality, and we really love that. I have kind of a weird question, and maybe a little self-serving, but what motivates you to rate restaurants with such detailed, high quality reviews? I mean, you’ve put a lot of time into what you’ve put onto AllergyEats and we really love that. What motivates you to do that? DB: Yes! Where I’ve now been several times. I would never have known about that if not for AllergyEats. In this case, we ended up going to one of the old school, really traditional steakhouses just because we thought it would be fun, and it was, and that’s the first review I ever posted on AllergyEats. They were incredibly accommodating. My dad put so much work into that. He went ahead of time to meet with the manager, and even went that morning to deliver rolls that I could eat so they would have them. It was very sweet. But anyway, when we got home that night, he was sort of still bowled over by the entire experience and how easy it was, and how discreetly they handled it. There was no show, there was no production, which is another thing that I think is hard to do but important. He was typing away on Yelp about how well they handled his daughter’s allergies and I was like, you know what, Yelp is sort of going to care about this, but where this information is really going to be valuable is on AllergyEats. So, I told him about you guys and he’s like, well, why don’t you post about it? So I did. I spend a lot of time on the Internet; I like the Internet. I like that we can all talk to each other from all over the world – I always have. 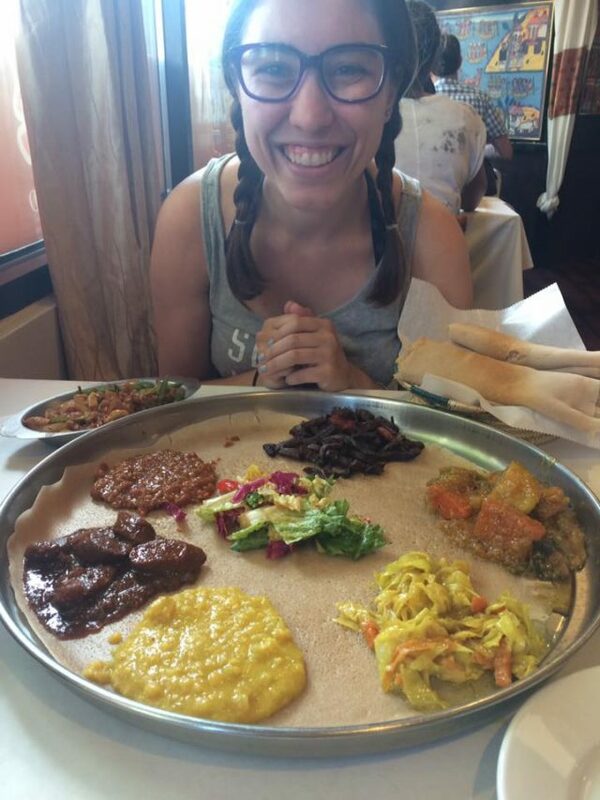 I had been hesitant to kind of connect with the community for a while, but what I found as I started to look around is that it seemed a lot of parents were trying to travel with their children and have these normal eating out experiences. I felt like if I had been to one place that I could suggest to somebody and help people who now have resources my parents didn’t have, then that would be useful. Then, you know it’s also nice when people click that your comment helps them out. But I think for me, I’m starting to learn sort of late, that food doesn’t have to be scary and eating out doesn’t have to be scary. I love food, and I think that’s a big change from when I was a child and my parents used to have to beg me to eat. I thought that this was information that would be useful to the community, and I remember struggling, and I know that it’s still a struggle, so if I can get out there and figure it out, then other people should too. AE: You said a comment that resonated with me. We did a survey a few years ago and some people said they didn’t rate because they said, “Well, we’re new to this and we don’t think we have much to add.” It sounds like you went through that stage but then realized that you DO have a lot to add. DB: Right, and I think, yes, it’s one person having one good experience, but that’s better than having no information at all. AE: We completely agree and, again, very much appreciate everything you’ve put in to help AllergyEats and help everybody else – it’s been really spectacular. Just to go back a minute, you were talking earlier about your initial experiences, I think in Chicago, where you’d go out with friends to a bar or dinner, just to be social, and you might just get a drink or a salad. We have plenty of people on AllergyEats who maybe don’t have children or have food allergies themselves as adults. Do you ask questions when you order alcohol? How does that work? 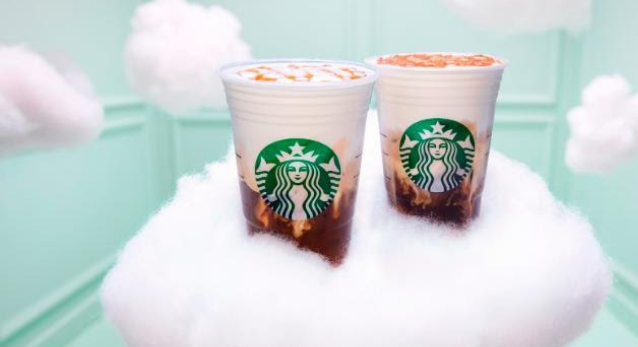 AE: Interesting….and while we’re talking about other types of dining experiences, have you ever gotten ice cream in an ice cream shop? DB: No, but I do have a really good ice cream story. I used to eat at a lot of Italian ice places when I was little, and we’d have them wash the scoop. One of the things that I realize now, thinking back on those experiences, is how much less careful we were in certain situations, I think just because we didn’t know. Like, cross-contamination was a thing that you talked about but that you didn’t understand to the degree that we do now. So, yes, they ran the scoop under water but then they stuck it in the sink with other scoops and I watch this now and I’m like, how did I do this? But I’ve never been to a real ice cream shop – I think just because I haven’t been in places where an accommodating shop exists. I think there’s an ice cream place in Philadelphia that could accommodate me, but they were closed when I was there. Anyway, so yes, [I usually eat] Italian ices. I tend to avoid sorbets, too, just because of the risk of cross-contamination, if they’re made in a place where they make ice cream. The worst reaction I’ve ever had actually was at a restaurant that’s now closed that was in New York. They specialized in non-dairy cooking. They didn’t cook with butter, but they had some cheese around and they had dairy options in desserts, and on your burger, and that was almost it. I went there all the time. It was called Josie’s, they closed about a year ago. Anyway, I went there all the time, never had a problem, and then I was with my dad and my college roommate. I never got dessert just because I never wanted it, but for some reason, we were like, Oh, why not? They had a non-dairy option but they also had regular ice cream, and the flavors that we ordered were both weird. One was blueberry, I think, and one was cinnamon. They were both these weird colors when they came out and we couldn’t figure out which was which and our actual server or the manager didn’t bring them out. Anyway, the bowl got switched and I ate probably half a teaspoon of ice cream; [I ended up with] nine hours in the emergency room and it was very scary. But it goes to show that, even in places that sort of specialize in that kind of thing, you have to question everything. 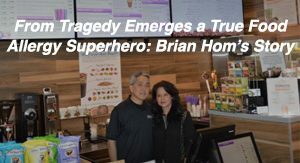 My parents and I went and met with the owner after that and they were really deeply apologetic and they wanted to know exactly what happened and mark the experience which was great, but the fact of the matter is that I could have died. That’s why I avoid dessert. 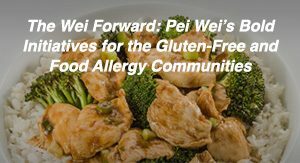 AE: Do you have any pearls of wisdom for the food allergy community? 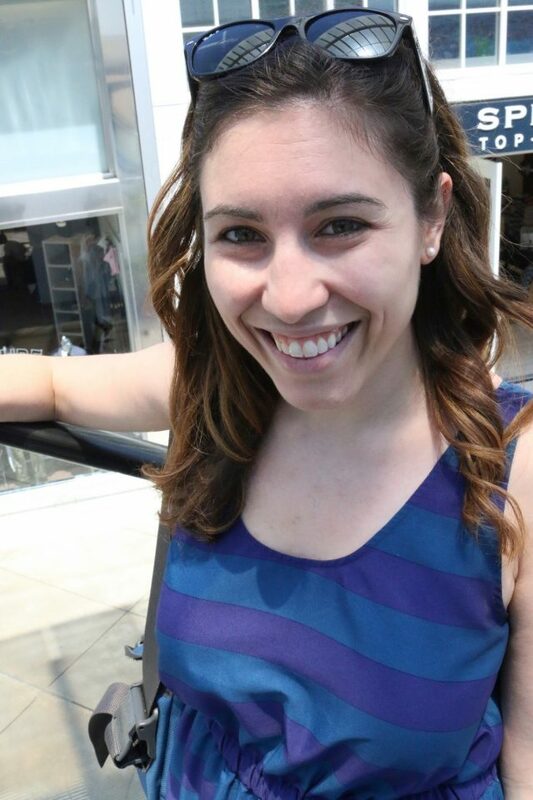 Embracing Life With Food Allergies! But, I think that there’s absolutely a way to advocate for yourself and be vigilant, ask all the questions that you need to and still really enjoy food and enjoy that part of life, and not be afraid of it. I spent so many years being terrified of food, but I want all that time back. I think there’s absolutely a way to be bold. You’ve got to know your stuff and ask your questions. I think the phrase that you used about advocating for yourself describes it. Did Deborah inspire YOU the way she has inspired us? Please comment below, and of course, if you have been reluctant to rate, like Deborah once was, it’s never too late to help the food allergy community. Share your voice today by reviewing your own restaurant experiences. Such a wonderful interview, her story is so inspiring. I can’t wait to serve her at my restaurant; if she ever makes it to Maryland! Thanks for sharing your experiences. My grandson is 3 and we have almost completely avoided food for him from anywhere but our kitchen’s. We used to take him out until my sister had several experiences where a salad on the menu listed no nuts and she found a walnut in hers! Not taking any chances with him but concerned about his future as he goes out into the world without us. We will be teaching him how to advocate for himself and hearing your story made me realize that I need to start doing just that now so I can teach him. I don’t want him afraid to eat out but I do want him to survive the experience! I am so proud of Deborah. She handles her food allergies with precision , detail and intelligence. She navigates her way to the proper personnel at restaurants, with grace , manners and diligence. May she stay happy and safe! I have tears in my eyes after reading her story. Partly because I understand her story through my food allergic 8 year old son and his fears of trying new foods. Part of my story as a parent and understanding what her parents had to do to keep her safe. I am trying to break my fear of exploring new restaurants, especially when my 11 year old daughter (no allergies) wants to try new places. I want to balance helping both of my kids. I also realize that my son needs to learn how to research and advocate for himself as he gets older. Wonderful interview! Thank you. This interview is fabulous-but not surprising!! Knowing Deb her entire life and the way she was raised, by incredibly loving and caring parents, I always knew she would be cautious and always know what to do to take care of herself and make the right choices!! Once while visiting my husband and I in NJ, we went to a local Italian restaurant! Deb’s Dad went into the kitchen with the Chef, to make sure that he used a brand new pot and prepared everything up to “safe standards”! The process has always been lengthy but was always done with the utmost care and respect! Their amazing concern has produced this wonderful and conscientious woman-who can conquer anything! Love and respect you Deb!! Deborah is such an inspiration to all of those living with or caring for someone with allergies! Her reviews have helped so many people to live and eat more freely. Hope she continues her reviews!! Deborah- you are such an inspiration! As a mom to two young boys with severe peanut, tree nut and fish allergies, I appreciate your insight so much! Allergy Eats is such a valuable tool to those of us trying to navigate the world of food allergies and reviewers like you are what make it a success! And what makes eating out less stressful and even enjoyable for others- so THANK YOU and God bless. Thank you for sharing your experiences, Deb! My 13 year old son has the same food allergies (peanut and dairy). Eating out is scary and a hassle–we don’t do it often. I worry about his physical and mental health. It seems ashame that he has to just drink a soda while his friends chow down on pizza, etc. But now that food allergies are so prevalent (two of his best friends have different allergies), there is much more awareness–I’m thankful for that. And thankful for you for helping the younger generation (and us parents) feel more confident in managing them. Thanks again! My son is now 6 years old he was born with malrotation of his bowels and after multiple surgeries he is severely allergic to all dairy and egg proteins. Even with all the resources available today I find myself terrified to allow him to eat out anywhere! My first time eating out for him was at Disneyland it was life changing for him. It was like having a personal chef for the day and I have never seen him eat so much, (he also is very underweight because his body has a hard time absorbing nutrients so the amount of food he eats is important. ) due to rising health insurance costs we had to give up our disney passes this year, my son so sad. Your story has inspired me to be even more proactive I want to be the kind of parent your parents are who find ways to make it work! I use allergy eats alot but I am in a rural area so not alot of ratings might be time for me to start doing some rating too!! Thank you! Very inspiring interview! Thanks for publishing! My ten year old is Ana to wheat, peanuts and tree nuts and also allergic to 8 other foods. Hoping to teach him to advocate as Deb does. He has a few safe restaurants where he feels comfortable ordering a hamburger patty and bringing his own sides, and that is a start! I’m one of those allergic kids (anaphylaxis to all tree nuts, minor to peanuts and fish) who are now adults making their way in the world like Deborah and I just had to say thank you for writing this post. I went through so many of the same things growing up (parents begging me to eat, afraid to eat out) and just like you I’m finding out not only how nice it is to eat out, but how important it is for things like business travel and dating and making friends in a new city. For parents and other budding allergy socialites reading this, the thing Deborah says about calling ahead could not be more spot on. Another thing I’ll mention is if you’re in a group of friends looking for a restaurant and can’t call ahead, ask about allergies before you’re seated – It’s happened to me a few times where I’ve had to drag my friends out of a place after they gave an unsatisfactory allergy answer, or worse, I’ve taken chances I wouldn’t have normally just to avoid the embarrassment! Thank you, Deborah, for all your your reviews and your inspiring interview! Many happy, tasty, meals in the future! Thank you — this was really heartening to read. I’m going to share it with my 13-year-old later. He just had a tough day, field trip with the class, and they went out for pizza and ice cream. He’s peanut, tree nut, sesame allergic, no legumes or seeds, AND he has celiac. He’s used to stuff like this, but today it really got to him. Good timing for me to read this. Thanks! And now I’m going to rate some local restaurants (well, the only two in town that we trust, but at least it’s something). Thank you so much for sharing your story! I always feel so alone outside of my family and boyfriend with how seriously I take my allergies. I have several friends who have allergies who don’t take them nearly as seriously and it often makes me feel like they and others think I am being overly paranoid and annoying when I voice my concerns. Even things down to alcohol make me nervous because of the lack of labeling and I constantly am contacting companies. I’m glad to know someone else out there my age is just as concerned and voices their opinion like I do! What a wonderful story. Thanks for sharing! I would love to hear some of your favorite allergy-friendly restaurants in Chicago. It’s a constant worry when we take our 3 year old out to eat and would love to hear about some of your go-to’s! Thank you all for your lovely, kind comments! I’m really happy to see that my experiences have resonated with so many people.